Notion of “roofbox” idea is put forward providing a concept and guideline; a pretty good beginning to make a model besides presentations. Reversal of the staircase proposal is studied in a very tight space. The interventions are presented in a graphical order that provided an in-depth understanding of the cases. Even though the impacts of shades could not be studied in such a short period of the workshop; in the future further interventions could be done in order to enhance the light inside the spaces. The students have investigated spatial relationships in section and not only in plan by extending the dwelling space on a second level which is attached on the existing settlements in hybrid manner which follows in an interesting way the scale and character of this residential informal development. Very good presentation. The fact that the students produced a small physical prototype shows the thorough investigation of design in different scales. This group has proposed an interesting extension solution of the choosen house. Due to dense built-up area the house can not extend horizontaly but must be done verticaly. This may be a prototype for the site as to make an extension of any house along the vertical axis. In a broder scope, this protype could be an example for the creation of a new residential structure above the existing. I agree. I did not visit Liberdade but from the students' presentations the area seems very cramped and going up may present the best way to develop the entire neighbourhood. It certainly works in this proposal. It demonstrates also the importance of working in section and 3-dimensions. Could a whole new urban and sociological experience be created among the rooftops? This is a very thorough analysis and quite a professional response to solving a real accommodation problem of the tenants. A very well-presented scheme both graphically and verbally. These students clearly worked very well together. The idea of building upwards is inspired and, along with the other simple moves internally, improves the accommodation while affording good views of the surroundings from the new room and terrace. 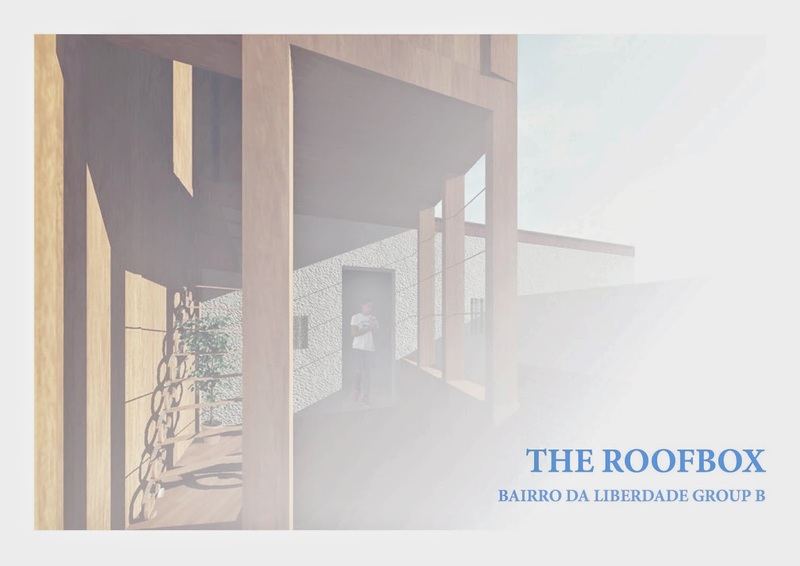 The thoroughness of the project from the clear analysis of the sociological and accommodation problem, through the design solution, to the calculations of embodied energy, to the detail for the terrace - all expertly graphically presented is convincing. There are a few queries? Are there any implications of reversing the staircase? Maybe not, but more context is needed on the drawings to explain this better? The inner bedroom is not ideal. Could removing part of the thick wall (structure permitting) and reconfiguring the bathroom have allowed for a door from this bedroom on to the hall? It is unclear how the new protruding timber box is to be finished - some kind of timber rainscreen maybe? A sketch detail would have been helpful here? The residents’ reactions would be welcome. Of course they would in all the proposals but particularly this one as it seems so focused on the residents’ immediate needs and it is very well developed. It is a credit to the students that at their review we were asking what would it cost? Only one other question remains – when do we start building?